Do you know what those crazy cats over at DC Comics decided to do when they heard the news Darwyn Cooke agreed to produce their cover art? Well, in December, 2014, Robert Venditti and Brett Booth took it upon themselves to whistle the theme tune to the Stanley Kubrick space classic, '2001: A Space Odyssey'. Come on. Let's join in!!!! To QUOTE The Photographer, Pedro Almodovar: 'Whenever I arrive on a real location, I have to move around and work out what the best angles are going to be'. On the whole I'd say this installment of 'The Flash' is a tale easily divisible by three. Now one part of the plot centers on our version of Barry and how he tries to acclimatize himself into his new Speed Force domicile. Another part of it focuses on Iris West, on how she shames City Hall by publishing an article relating to how they dispose of their dead bodies. And last but not least, in the third part of this tale Patty Spivot and 'rude Barry' start to investigate a prominent speed dependent killer. Yeah. You know. Just like that horse and carriage killer seen at the very end of this yarn, Hint-Hint! Plus to some extent I can say exactly the same thing about Robert's story-line too. Even though focally I wasn't too pleased with the flow of his conceptual narrative -- more on that point later -- by in large I was very pleased with how he took three vastly different story strands and managed to weave them all together. 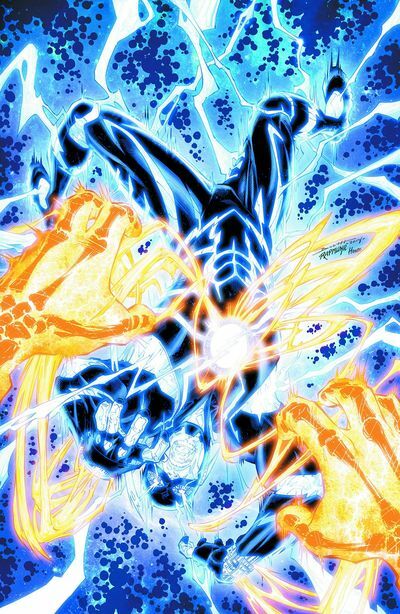 Personally speaking, the sequence I liked the best was the one where 'Current-Barry' started to figure out where he was in the speed force. In my eyes some much needed explanation was conveyed on the page, and it did justify why Barry is here, where Barry actually is, as well as who those other people are around him. Of course, I do apologise for not being able to expunge upon this matter in more detail. It's just if I did that, well, I will be giving the game away. Big time. Plus it was nice to see how this story fitted into another story told previously in this series. My only slight gripe with this adventure was that none of the three story-strands presented stood out from the crowd. Not that this is a bad thing mind you. Because as I said previously, by in large I thought this issue was a very good issue. It's just that focally I was never quite certain how this story was going to flow until it reached its final stages. And then this was only apparent because its general narrative took a dip into 'cliff-hanger county', hint-hint. A song suddenly sprung to my mind during that scene where Patty frowned upon Future-Barry's disdainful remarks. Well, if you where in her shoes, wouldn't you also think about the following melody performed by Matthew Sweet? You know. The one entitled, 'I Thought I Knew You'. As implied previously, my favorite scene in this entire issue was the one where Barry and his time-displaced buddies fought against a group of dinosaurs. So in honor of this great scene, I now feel compelled to compare this comic to a group of cavemen kicking the cr*p out of each other. Bless 'em. 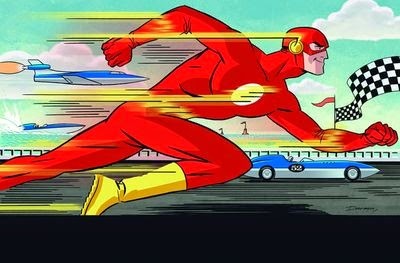 Now I know you're called the fastest man alive, but that was ridiculous! Are you seriously trying to tell me Batman taught you how to do that thing with your tongue? No wonder Catwoman keeps on hanging around him! Why did you keep on calling out Iris's name, Barry? I more than understand that you need a costume for fighting crime, but do you really need one when 'little Barry' comes out to play? Well, that beat's leaning against the washing machine. Next time we do that together, honey-bunch, please try to refrain from phasing through my body. Why did you keep on calling out Wally's name, Barry?